It is a well known statement that employees can be a company’s greatest asset or downfall. The way in which a company manages their employees can help determine into which category their staff falls. Giving regular performance interviews can either increase or decrease an employee’s contribution to a company. Having a good Performance Interview Checklist to guide your supervisor through the interview process can help. Download the interview checklist template for free right here today! 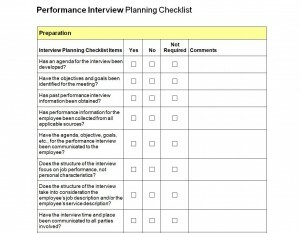 Using Microsoft’s Performance Interview Checklist template, not only relieves the stress of remembering all of the details required to perform an interview; it is also easy to use, and completely customizable. You can get it free right here. This template can be printed out in a matter of seconds, and is a valuable guide to help organize and prepare the employer or supervisor for the meeting. It’s easy to read layout, has three main categories; preparation, execution and the conclusion. Each of the categories within the template has a list of questions that not only help prepare the performance reviewer for the interview; but also guide them throughout the process. The preparation category reminds the interviewer of the paperwork and steps required to prepare for the interview. Things like documents collected, meeting place reserved etc. are included in this category. The execution category has questions to help keep the interview running smoothly and on a positive note. Questions in this category help to encourage positive communication and feedback from the employee so that further growth is acquired. The conclusion category provides questions that serve as reminders for setting future goals, interview dates, and preparing necessary paperwork regarding the review. First, simply read over the columns to see if the questions apply to your particular business. Second, if there are any questions that do not pertain to the type of work performed by your employee or your company; simply delete them from the template. Third, if there are additional areas that need to be covered for the interview, add them to the template’s columns. Fourth, print out the template and save the original for other employee performance reviews. When employees receive positive and organized reviews it can increase their performance level; thereby encouraging more growth within the company.